Baseball, also known as “America’s pastime,” has a long history of being heavily ingrained in media. Here’s a list of some noteworthy references to baseball in comics and animation. This issue was part of a storyline in which Billy Batson and Uncle Dudley go on a road trip to cover American landmarks for WHIZ. This issue sees them end up in Detroit, where Mr. Tawny, the talking tiger, wants to play for the Detroit Tigers baseball team. Things end up getting much more bizarre, as Mr. Mind (the telepathic genius worm with goals of conquest) has also shown up in the Motor City. The World’s Wickedest Worm decides to pit a baseball team made up of bizarre aliens against Captain Marvel. Of course, the World’s Mightiest Mortal makes short work of Mind’s team. The 1937 short “Twisker Pitcher” sees Popeye and Bluto play on opposite baseball teams. Unusually, it’s one of the rare shorts where Bluto eats spinach, specifically Popeye’s. (A rare attempt by Bluto to usurp Popeye’s use of the vegetable.) Of course, our hero eventually triumphs despite this setback. Clips from “The Twisker Pitcher” (with some redubbed dialogue) appear in the 1939 clip show short “Customers Wanted.” The latter short is now in the public domain. One of the earliest shorts in the “How to” Goofy series, this 1942 entry shows two teams of Goofys “demonstrating” the national pastime. Not as funny as the hockey short “Hockey Homicide,” but still amusing. This 1946 Bugs Bunny short sees Bugs forced to play a baseball game (as a one-man team) against a cheating team of thugs (the “Gas-House Gorillas”). What follows is a lot of classic Bugs antics and cartoon physics, including an amusing pinball/”TILT” gag. “DC Super Stars” #10 (December 1976). Art by Ernie Chan. “DC Super Stars” #10 (December 1976) saw the cover billing it as part of their then-current “Strange Sports Stories” series. 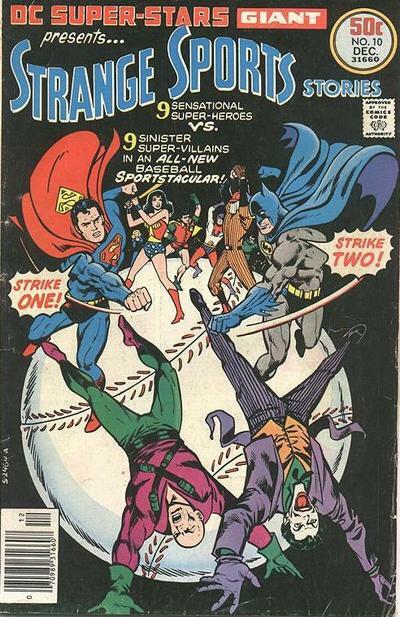 The story saw some of the top DC Comics superheroes forced into playing a baseball game against some of the company’s top villains, all at the behest of the Golden Age supervillain husband-and-wife pair, the Sportsmaster and Huntress. The good guys’ team consisted of: Superman, Wonder Woman, Robin, Kid Flash, Batman, Green Arrow, Huntress, Plastic Man, and Black Canary. The villains’ team roster: Lex Luthor, the Joker, Dr. Polaris, the Tattooed Man, Felix Faust, the Weather Wizard, Chronos, Matter Master, and Sportsmaster. Serving as umpires were Uncle Sam (of the Freedom Fighters) and Amazo, the android with the JLA’s powers. This particular “Strange Sports Story” got referenced a few later times. One instance is in an episode of “Batman: The Brave and the Bold,” which saw the heroes playing the villains again in a baseball game. Charles Schulz’s “Peanuts” is famous for its use of baseball, with Charlie Brown’s futile efforts at winning his favorite game. 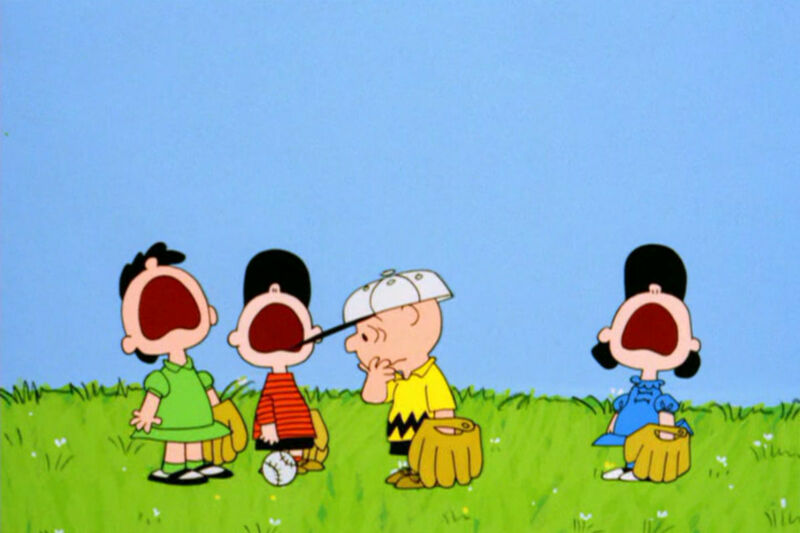 A running theme is that Charlie Brown’s team aren’t much better than he is: Lucy misses easy catches and heckles her own manager; Snoopy’s occasionally sleeping in the outfield (and missing other easy catches). There’s also the occasional meetings at Charlie Brown’s mound that often end in his teammates distracted by some off-topic argument or debate. Several “Simpsons” episodes have focused on baseball. The second season episode “Dancin’ Homer” sees the family attend a baseball game by the local minor league team the Isotopes; Homer somehow ends up becoming the Isotopes’ mascot. The following season’s “Homer at the Bat” features Homer playing softball (not baseball) for the power plant’s team. Despite the team being a success (thanks to Homer), Mr. Burns brings in MLB ringers so he can win a bet.